Here are driving directions from Kona International Airport to Courtyard Marriott King Kamehameha's Kona Beach Hotel, courtesy of Google Maps. 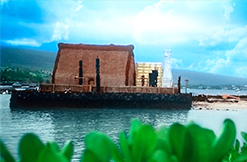 The ancient heiau temple is the last residence of Kamehameha the Great. Kamakahonu was the first capital of Hawai'i as Kamehameha the Great established residency there in 1812, entertaining visitors and conducting affairs for a newly unified kingdom. Kamakahonu, the historic site of the Island Breeze Lü'au, is unique to all of Hawai'i. Here Kamehameha the Great, Hawai'i's king who conquered all the Hawaiian Islands in the early 1800s, made his home and ruled the Islands. Home to Hawaiian Ali' i (rulers), Kamakahonu was kapu (forbidden) to the average Hawaiian. King KamehamehaKamehameha worshiped his gods and sought the advice of his generals and advisors at the Ahu'ena Heiau (the temple adjacent to the lü'au grounds) and now restored. Upon Kamehameha's death in 1819, his body was prepared for burial at a stone platform near the lü'au stage; the location of his burial site is one of the great mysteries of Hawai'i. In November of 1819, Kamehameha's wives, Ka'ahumanu and Keöpüaolani, publicly ate with his heir, Liholiho, breaking the ancient Hawaiian kapu system (that men & women must eat separately), Kamehameha's high priest, Hewahewa, led in the destruction of na ki'i (idols at Ahu'ena). This began the dissolution of the native Hawaiian religion. His priest also predicted that a new religion would arrive in Kailua-Kona. In the spring of 1820, the first missionary party from New England arrived in Kailua-Kona aboard the brig Thaddeus. They stepped ashore at the south end of Kamakahonu Bay on to a rock that for decades was known as the Plymouth Rock of Hawai'i. Within the lobby of the Courtyard Marriott King Kamehameha's Kona Beach Hotel are displays, paintings and artifacts that tell the story of the Hawaiian ruler's life and times.